There are many important aspects to owning a racehorse. Having a good time at the stables and races is of course hugely important, but ultimately we want the horses to perform well where it matters - on the racecourse. Success can’t be guaranteed. Yet it finds Hambleton Racing and our trainers over and over again. Our trainers share a common characteristic - an appetite for hard work and attention to detail. It’s an approach that explains why Hambleton’s trainers saddle so many winners and why so many of our horses fulfil their potential. Our racing record is a proud one. Over the past 15 years, over 50% of our runners have won or placed. This means that, statistically, you’re odds-on to be standing in the winners’ enclosure every time you go racing. While others have come and gone, we’ve consistently achieved these excellent results over a long period of time. We’re proud of this consistency and remain committed to maintaining the excellent levels of success our owners have come to expect. At the sales, we’re thorough, underpinned by some of the sharpest minds in the bloodstock industry. Our no-stone-left-unturned approach has paid off with notable success with cheaply sourced horses winning big races. 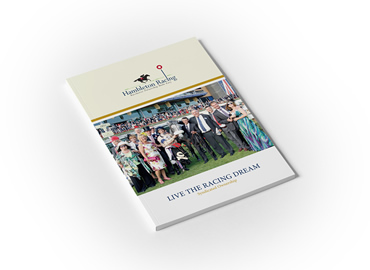 Hambleton’s racing record testifies that it’s quite possible for our horses to compete with distinction at Group level, or win races at top meetings such as Royal Ascot and York. A brief compilation of some of our winners appears below. "Does it ever get much better than this? Newmarket on a Saturday, Listed race, champion jockey on board… another great day to remember. Thank you."